A Republican on the Senate intelligence committee says Russian internet trolls are using the controversy over NFL players kneeling during the national anthem to stir up unrest in the United States. Sen. James Lankford of Oklahoma said Wednesday that the Russian troll farms were hashtagging "take a knee" and "boycott NFL" to amplify the issue. He said the effort involved "taking both sides of the argument" to increase divisiveness in the country. Earlier this month, Facebook acknowledged hundreds of fake accounts, probably run from Russia, spent about $100,000 on ads aimed at stirring up divisive issues such as gun control and race relations during the 2016 U.S. presidential election. Lankford on Wednesday referenced what he called "the Russians and their troll farms and their internet folks” spreading dissent over the controversial protests during a hearing of the Senate Homeland Security and Government Affairs Committee. "They were taking both sides of the argument this past weekend, and pushing them out from their troll farms as much as they could to try to just raise the noise level in America and to make a big issue seem like an even bigger issue as they’re trying to push divisiveness in the country," Lankford said. "We've continued to be able to see that, we will see that again in our election time," he said. Lankford also asked acting Homeland Security Secretary Elaine Duke if the department has the resources it needs to do on-site assessments of voting security for any state that requests it before the 2018 midterm elections. Duke said that the department does have the resources, but not all states have asked for federal assistance yet. The leaders of House Intelligence Committee’s investigation into alleged Russian interference in the election said Wednesday it will hold an open hearing with tech companies in October "in order to better understand how Russia used online tools and platforms to sow discord in and influence our election." 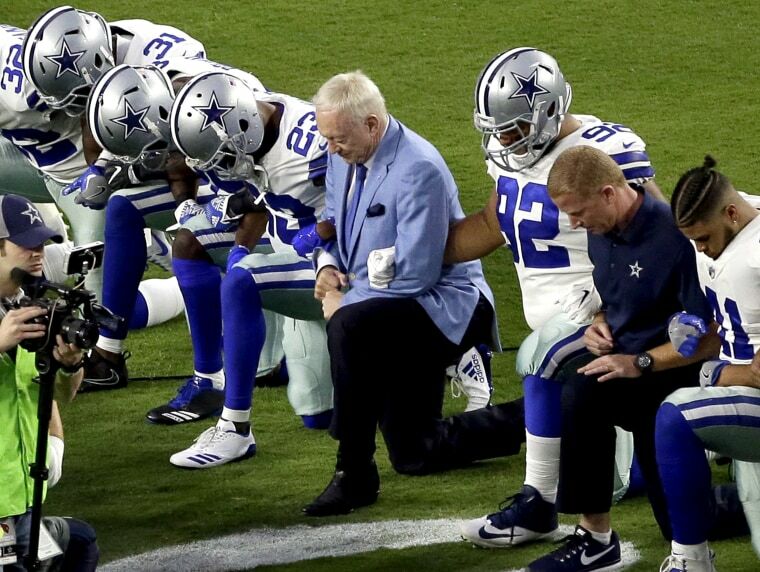 Over the weekend, players and even some coaches and owners around the NFL took a knee during the national anthem, stood locked arm-in-arm, or didn't emerge for "The Star-Spangled Banner" after President Donald Trump in vulgar terms called for players who kneeled during the anthem to be "fired." Trump made his comments at a campaign rally for Sen. Luther Strange in Alabama, and further inflamed tensions with athletes by calling out the NBA champions Warriors’ Stephen Curry on Twitter and withdrawing an invitation for a White House visit. Strange lost Tuesday's runoff in a landslide. Several NFL team owners and NFL Commissioner Roger Goodell called Trump's comments divisive, and some owners called them "offensive." The recent phenomenon of NFL players sitting or kneeling during the anthem was started last year by then San Francisco 49ers quarterback Colin Kaepernick, who said he was taking a knee to protest police brutality against black people and racial injustice in general. Kaepernick is now an unsigned free agent. Trump at the Friday rally in Huntsville also suggested that the players were being penalized too often for making aggressive tackles in which players "hit too hard." Over the past several seasons, the NFL and college football have increased penalties and enforcement for illegal hits to the head and for hitting defenseless players. A July report on 202 former football players found evidence of a debilitating brain disease linked to repeated head blows in nearly all of them.